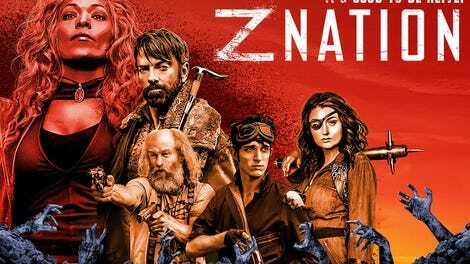 I’ve been wondering how Z Nation would manage to return to its periodic stand-alone episodes without feeling like the show was reverting to its messy low-rent past. The answer came this week: By delivering one hell of a mystery. “The Unknowns” is the episode of Z Nation I might choose to show someone who’s never seen the series, as a way of demonstrating just how far this apocalyptic road-trip story has come. It’s tense, nervy, and entertaining, all while still managing to unpack some character studies of Sarge and Warren, and even give a moment to Murphy’s unsettling flesh addiction. Nothing about this inscrutable underground lair is explained, and by the end of the hour, there’s no justification or reason given for why our team was imprisoned. There’s just a truck that starts by itself and a lingering memory of that horrible sound, with the evidence on the highway of ever more people being picked off and entombed within those walls. The group could shake off the experience as a bad dream, and avoid referring to it ever again, were it not for one telling line uttered by the anonymous fellow inmate prior to his death: “This is bigger than the apocalypse.” Someone has this much power and capability, and they’re still out there. Sure, our main narrative essentially stopped dead in its tracks, but it’s impossible to complain when the results of an isolated side story are this good. Series co-creator Craig Engler penned this installment, and much like “The Vanishing” (which Engler wrote with his fellow co-creator Karl Schaeffer) two weeks ago, this narrative reveals the creative team in control has a sharp grasp of what they’d like Z Nation to be, and the smartest way to get there. There’s always been some intriguing puzzles in the background of the show’s mythology, but what used to be the odd tease on a gonzo action show has bloomed into almost the reverse: The series is becoming a full-fledged mystery-horror hybrid, and it’s the best thing that could have happened. Who knows if it can sustain this wonderful atmosphere of dread and tension, but I admire the commitment to a wholly different (and superior) mood. The unknown facility seems to be some type of grotesque experiment: Keep people boxed up, put them into random groups, and then turn them loose to solve a puzzle or problem. Once the task is completed, knock them unconscious, and return them to their crate to await the next life-and-death mission. It’s disorienting and disturbing, especially because what little information Warren and the others do receive is so chilling: “You can’t fight the sound. Just do what they want.” These are some of the last words Warren’s first partner utters before she’s torn apart outside the elevator, and they are the definition of hopeless. The noise seems to be triggered by any group completing a task, as more than once everyone gets knocked out arbitrarily, meaning the whole population is on more or less the same sound system. Some of these tasks have clear stakes: Doc and 10k are meant to fix the gas leaking from pipes, Warren and the random guy need to get that door working again, and so on. But more often than not, outings end just as abruptly as they began, with people having little more than a couple minutes to explore a new location before being rendered unconscious again. And even those seemingly straightforward tasks end up being potentially about something else entirely. Doc and 10k’s mission ends not when they stop all the gas, but when 10k manages to use CPR to bring back Doc; suddenly the hiss stops, and the green gas evaporates. It’s almost like Z Nation’s version of the movie Cube: Random people are kidnapped and inserted into a massive technological edifice, where their only hope is to work together and try to derive some meaning from the overwhelming and implacable machinery threatening their lives. And the stakes bring out unexpected sides of our team. Sarge reveals a skill for talking down someone in a panic attack, thanks to her own experience with PTSD, stemming from a traumatic family life. Lucy befriends a Z named Carson, and manages to spring everyone from the nightmarish lab-rat experience in the process. And poor Murphy, once more revealing his desperate need to connect with his daughter, and showing that his eating of his own skin is something more than just an impulsive aside. It was worrying to witness, so it came as a welcome relief to see him eat a dead bird and cough out a few feathers. But the real problem is his bite. Murphy is in bad shape, and now that he’s been cured of his condition and then had it wear off again, who knows what this will do to him. (It’s not looking good right now.) And Warren is trapped inside her vision-world, staring down the black rainbow as the car hurtles toward an unknown destination. With two hulking, inscrutable mysteries lingering over everything (the disappearance of the outpost population, and now the Facility Of Crates And Torment—FOCAT for short), it’s a bad time for a crisis. But if it means a Z Nation like this, then we’d be willing to inflict far worse on our protagonists. (Hopefully not, though. Mysteries are fun; suffering, less so.) It wasn’t perfect—Sarge getting knocked out and being saved by whatever deus ex machina came along to stop that Z beggared some belief, as did the inexplicable phase-shifting of Warren and Murphy into different realities in that hallway for a brief moment. But these are minor quibbles. 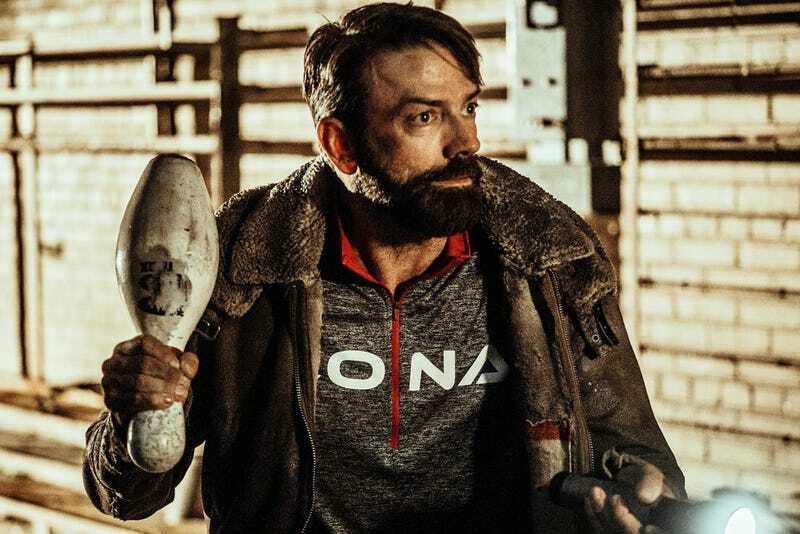 For now, Z Nation is doing some of its best work yet. Every time the noise happened, it was unsettling. Well done, show. That girl falling to her death from the ladder she was crawling across with 10k was legitimately upsetting. It was the agonizing scream that did it. Assuming the one guy was telling the truth, and Zona has nothing to do with this place, my first question is whether this will be revealed to be part of the same unknown entity that effected the outpost disappearances. “I love dog food!” Of course you do, 10k. Nothing says “reassuring” like hearing from Lucy that even the Zs are scared.